Though we are set to pass this milestone at least twice, as I have just deleted a load of dormant accounts and spammers and brought us just back down below the threshold again! I will probably keep us down near 5000 members whilst I get rid of all the dormant accounts over the next six months, as I think its better to have quality than quantity. Update: 1000 dormant accounts deleted and we are still above 5000 members! 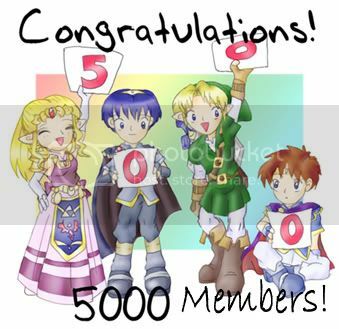 And we've just passed the "5000 members" milestone for the second time! This afternoon at 1.43pm we hit our highest ever "users online" rating of 101 users! We've also topped 75,000 posts on the forum, meaning we made 25,000 posts in 15 months. You can also tell it is application season as we've had 280 people sign up in the last month. I wonder how many will stick around and join in the community as opposed to just obsessively tracking the progress thread!? And again, 121 users at 8.57pm! Is the 8-9pm hour our peak user time? choirgirl wrote: And again, 121 users at 8.57pm! Is the 8-9pm hour our peak user time? Let me be the first to say, "Can I get a woop woop?" To it, or at it?!! We've now topped 100,000 posts on the forum and 10,000 topics, meaning we made 25,000 posts in 12 months. About 200 people per month join the site, and despite deleting accounts which are not signed into within 12 months of signing up to the forum or those that have never posted and have not been signed into in the last 12 months, we still have over 6000 members. Over 123,456 posts and over 12,600 topics are on the site now, with a record of 180 users online at once last march. I bet that these numbers rise over the application season! 221 users online at the same time this March. 138k posts on 14k topics and over 7000 members active in the last year. So the site continues to grow, and we are sustaining a steady 10 million page views per year, with a very low bounce rate.